This chapter will discuss how to use the revised Bloom's Taxonomy as a framework for not only creating learning objectives but also as a guide to select tools to reduce the use of discussion forums and support faculty in broadening their thinking about the variety of tools that can be used to address learning objectives. Tools include: wikis, blogs, quizzes, journals, Web 2.0 tools, infographics and videos. These tools reduce faculty dependence on discussion forums and support faculty in broadening their thinking about the variety of tools that can be used to address learning objectives to create manageable workloads. Discussion boards are included as the primary means of content delivery and course assessment in many online courses. A discussion board (WhatIs online dictionary, 1996-2016) is a general term for any online “bulletin board” where a person can leave and expect to see responses to their text messages. The online dictionary states that a discussion board can also be referred to as a discussion group, discussion forum, message board, and online forum. Discussion boards are text-based, asynchronous forums where students and instructors participate in dialogue online. Maintaining a high level of instructor presence in discussion forums balanced with a manageable workload is challenging. In addition, poorly utilized discussion boards with low level cognitive processing, such as reporting information, summarizing readings and/or defining ideas and terms, do not guarantee that course outcomes will be achieved. Our theoretical view of the discussion board is that it needs to facilitate a sense of community, support high-level cognitive processes, and support teacher presence in the online environment without staggering time/response demands. Wuellner (2015) found that online tasks requiring higher levels of cognitive processing resulted in more time spent completing assignments in online courses. This increased time in the online course resulted in higher academic performance. 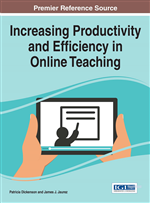 To increase online faculty efficiency, in other words decreasing the amount of time faculty spend assessing student work, a first step is selecting the appropriate tool in the learning management system. In addition to the discussion board, the online learning environment offers tools such as wikis, quizzes, and journals, as well as Web 2.0 tools for videos and other visual tools. The appropriate tool will support a quality online learning, one that: a) actively engages the learner in the content and the community of inquiry, b) encourages teacher-student, and student-to-student interactions, and c) supports the development of higher-level cognitive processes. In addition, however the faculty member engages with their online student, it needs to facilitate the development of a strong teacher presence in the online environment. Teacher presence or teaching presence, as defined by Anderson, Rourke, Garrison, and Archer (2001) is created by how teacher designs, facilitates, and “ . . . directs the cognitive and social processes for the purpose of realizing personally meaningful and educationally worthwhile learning outcomes” (p. 5). Currently, asynchronous text-based discussion boards are common tools used in online courses and are a primary means of content delivery and course assessment (Bill & Lawrence, 2009), including creating teacher presence. Describing the importance of discussion boards in online learning are Harman and Koohang (2005) noted “ . . . that discussion boards represent the primordial milieu in which e-learning and communities of learning emerged and that discussion boards remain an integral tool for e-learning” (Introduction, ¶ 2). Harman and Koohang (2005) also cited several authors, Barker, Clyde, and King, who support their view that discussion boards are an integral part of e-learning, and as such are a part of all the major e-learning platforms. Unfortunately the evolution of the discussion board as the primary teaching tool used in online courses does not necessarily engage the learner or create robust student-to-student interactions (Bill & Lawrence, 2009). At that the same time, faculty participation in and assessment of discussion boards can become unmanageable if students are making multiple posts to an overused online tool. And Mandernach, Dailey-Hebert, and Donnelli-Sallee (2007) argued the importance of “tangible evidence” in the discussion forum as evidence of instructor’s presence. If an instructor has 20-25 students in an online course and assigns 5-8 posts per student per week in the discussion forum, the amount of time an instructor would spend commenting and responding to all of these posts is not an efficient teaching and learning strategy.